Fun & Funky Ceramic Beads and Pendants or All the Ceramic stuff that doesn't fit into other categories, and some that do! These are some of my favorite beads ever--gnomes are a big deal in my family. These are so special--each one has a different face, and their expressions are amazing. They are about 26mm high and have a nice beading hole through the hat. They are $1.00 each. If you buy 12 or more, the price is 85¢ each. 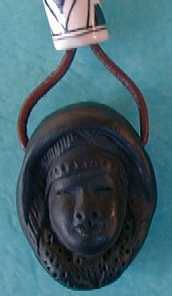 Black Face Pendant; 23x30mm. 80¢ each. 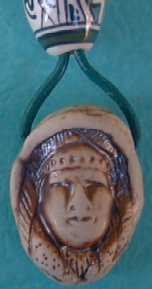 Ecru Face Pendant; 23x30mm. 80¢ each. 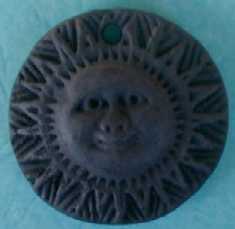 Black Sun Pendant; 35mm. $1.00 each. Wreath Pendant; 30mm across. $1.00 each. 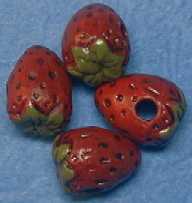 Strawberry Beads; 12x15mm. 60¢ each. Grape Beads. 28mm x 13mm. 60¢ each. Red Apple Beads. 18mm x 16mm. 60¢ each. Green Apple Beads. 18mm x 16mm. 60¢ each. Black Cat Face Pendant. 26mm x 22mm. 80¢ each. Celtic Knot Mix. 24mm x 24mm. $1.40 each, $1.10 each if ordering 5+.